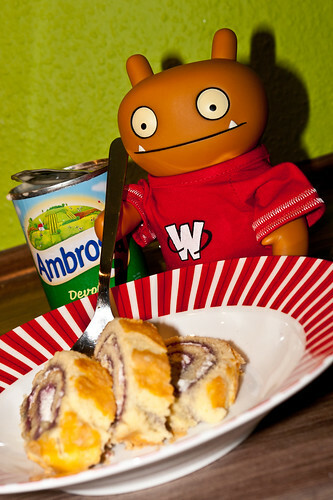 Uglyworld #1510 - Swiss Rollers & Custarders (Project TW - Image 108-366), a photo by www.bazpics.com on Flickr. I was standerings at the windowers of the cookie cave the wholes day long keeperings an eye out for anyone tryerings to diggers a tunneler into our cave to steals all our cookies. Once I was happiers that they workiesmen had leavereds for the day I began thinkerings what I could has to eaters, and then I remembereds that when me and Baz was in the Uniteders Kingdom a coupler of weekies ago we scoreds some tastiers goodies. One of the tastiers goodies we scoreds was some tinnies of custarders, and when I thinkereds about addering a coupler of slices of homes made swiss rollers from Mireille's mama then I knew I had hittereds the jackpotter!